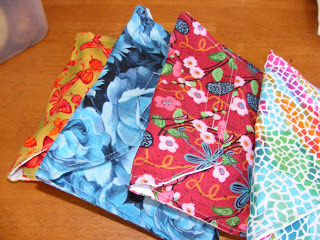 A couple of months ago (I think) I shared my fat quarters of fabric, and said I was going to put together some "labour kits" like I had seen over at Chica and Jo - and I finally got around to making them... the bags have been made for a few weeks, but while I was sick I had no desire to do anything with them, so I've only put them together in the last few days. I'm happy with how the bags turned out - I used half a fat quarter (a fat eighth, I guess?? ), and lined them with some calico I had hanging around... and the beauty is, they are bid enough to fit a wipes case and a couple of nappies in, so they're usable after bubba arrives, too!! 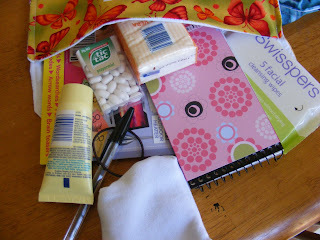 The bag contains - a pair of socks, a pen, notepad (that I covered with some 3 bugs in a rug paper), a hair tie, tic tacs, puzzle book, face wipes, moisturiser and tissues. I'm really happy with how it turned out - now I need to get off my backside and contact a few people, and get them in the mail to their new homes!